Introducing the Ugly Stick tackle bag. If you’re looking for an affordable, durable, lightweight tackle bag that you can throw on your shoulder and go then The Ugly Stick tackle bag is for you. In this article, I will show you what is included with this tackle bag and some pros and cons of the bag so you can make an informed decision on whether or not to purchase the Ugly Stick Tackle bag. So let’s start with the pros and cons of the bag. As you can see the pros outweigh the cons by a long shot. Now I will explain some of the features of the Ugly Stik tackle bag. 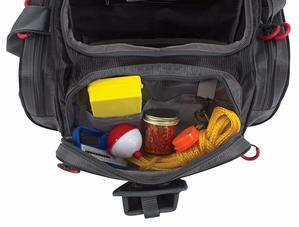 This tackle bag has many essential features that it comes with. The tackle bag is built tough, comfortable to carry and compact with enough room for what you need to have a successful fishing experience. There is no fishing tackle bag quite like the Ugly Stick Tackle bag! This tackle bag is made out of tough polyester with a roughed up bottom surface that won’t slip and slide around your kayak or boat. The base is also made of a strongly compressed mold that keeps the bag from sagging. It’s waterproof as well. The waterproof feature is critical especially when you are kayak fishing. You know that water will get into your kayak. That’s just a matter of fact. The Ugly Stic tackle bag is not too big and not too small. It fits in a kayak a lot better than a standard hard plastic or metal tackle box would. It will mold to your kayak. The Ugly Stic tackle bag measures 11.7 x 9.4 x 7.5 inches and has a 20.8-liter capacity to fit all your fishing lures, line, and fishing tools. This bag comes with four plastic tackle box containers. The tackle trays measure 10.2 x 6.6 x 1.6 inches and have dividers so that you can organize your fishing lures, split shots and small bobber any way you like. The tackle trays that this bag comes with are not recommended for tiny swivel lures or loose hooks because they will get under the dividers and slide all over. These tackle trays also come with ruler type measuring on top of the containers. This is convenient for measuring the fish that you catch to make sure they are within the legal length. 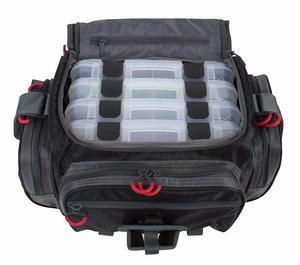 If these are too small of tackle containers for you, the Plano 3600 series tackle trays will fit in this bag. This tackle bag has a padded shoulder strap with a mesh top handle which makes the bag comfortable when carrying from place to place. It comes with three external accessory pockets that zip shut so that you won’t lose your fishing tools if the bag gets tipped upside down. The Ugly Stic tackle bag also comes with a removable fishing tool holster with a belt clip. So you can clip this onto your belt and have all your pliers or your hook removal tool right on your waist where you can access them easily when you need them. The belt clip fits on most 2” wide belts. There are also outer stretchy bands to slide in tools or your plastic bottles of bait scent for easy accessibility. This tackle bag is also guaranteed with a lifetime limited manufactures warranty so no need to worry if the bag fails you in any normal use way Ugly Stic will replace it. I recommend the Ugly Stic Tackle Bag for its roominess that can hold all the fishing tackle and tools that you need to have a successful fishing excursion. The tackle box trays help with organization of your tackle so you will find everything you need when you need it without having to rummage through the bag. It’s perfect for kayak fishing. The bag is comfortable to carry with its padded shoulder strap. The bottom of this tackle bag is durable won’t sag and is waterproof. The removable tool holder for your pliers is another feature I love about the Ugly Stic tackle bag. You unclip the tool holder from the pack a clip it on your belt. So now you have your hook remover tool right on your waist. This way you can retrieve it quickly when you catch a fish that has swallowed the hook. 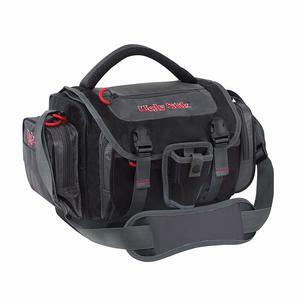 You also can’t beat the affordable price on this tackle bag. If you have any questions or comments, please leave them below in our comments section. You can also visit our contact page and send a message there. I hope this review of the Ugly Stic Tackle Bag helped you make an informed decision on whether or not to purchase this product. At Tackle Box Talk You can Have Your Fish and Eat ’em Too! Happy Fishing! Previous Post Fly Fishing Beginners Guide – Discover What You Need To Start Fly Fishing Next Post Sun Dolphin Excursion 10 – No More Excluded Fishing Spots! I don’t fish, but I have been looking for a product that I can use when I prospect for gold. I need something to carry my small tools and accessories and this sounds ideal. I can put any gold I find into a small container before placing in the compartments, so that they will not slide under the dividers. I like the fact that it is lightweight as I would need to carry it using the shoulder strap. What a truly versatile unit. Hi Rosie, Yeah you could use this tackle bag for just about anything You would want. Strong and lightweight so you can bring it with you where ever you go and put just about anything in it. Thank you for this great review of the ugly sick tackle bag, I find it really informative and highly descriptive. At around $36 I think it is highly affordable and cheap. I like it because it has a long warranty and because it is lightweight, can this bag be shipped to anywhere in the world? It can ship anywhere in the world. When I was going fishing many years ago I was thinking of buying a bag like this because this way you can have everything organized and easy to find whatever you need. If I ever start it again I will keep in mind your article as I believe anyone who likes fishing needs something like this to keep all equipment easily accessible. I love this tackle bag. 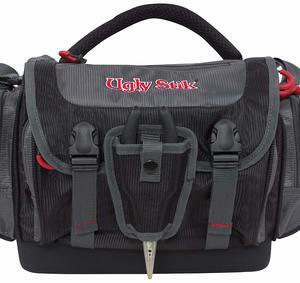 It looks nice and rugged, I wonder why it is called ‘ugly’ tackle bag though. To me, it is beautiful. I have a sister who will be going on fishing excursion by April. I am planning to get this bag for her. Thanks so much for the review, it makes me fall in love with the bag. I want to know if there is any other place to purchase the bag apart from Amazon. I think you can purchase at Cabelas as well.